The exhibition addresses the architectural and urban development of Berlin and the values of its urban space through a series of student projects. An exhibition of the University of Texas in Austin - Prof. Barbara Hoidn and Prof. Wilfried Wang – and of the Potsdam School of Architecture – Prof. Bernd Albers, Prof. Jan Kleihues, and Prof. Dr. Silvia Malcovati. The city of Berlin is growing and changing in its size, form and character. However, these changes should not be left to the market, they need larger ideas and strategies. After the first exhibition, Berlin 2050. Konkrete Dichte in 2017, the student projects of the University of Texas in Austin and the Potsdam School of Architecture are now working on the topic of Space and Value. The value of urban space does not only lie in its economy, but even more in its material and cultural quality, in its history and traditions, in the potential for its citizens to identify with it, and in the possibilities it offers for social and cultural integration. The aim of this exhibition is to review and redefine these values, and to introduce them to the broader discussion about urban development by making them tangible through a series of projects. 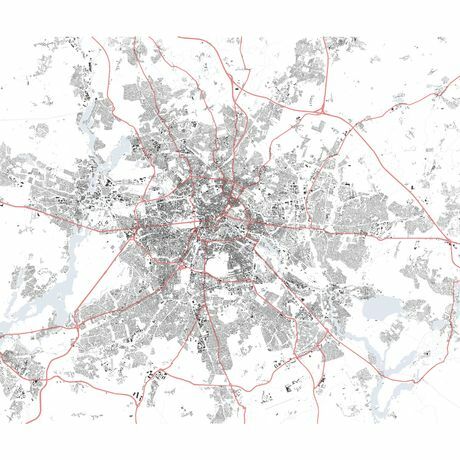 The projects address the basic structure of Berlin: The nucleus and the radiating main roads that became crucial for the development of Berlin’s urban space in the 19th and early 20th century and that consistently extended space and value away from the center.